With great power comes great responsibility. Regardless of whether or not a person is a Spiderman fan or even a fan of comic books in general, most people know that timeless line spoken by Peter Parker’s uncle Ben. It is also a piece of knowledge that would have served the founders of Image Comics well when they founded the independent comics company. That is evident in watching Shout! Factory’s new documentary on Image Comics The Image Revolution. While it is a documentary that centers mainly on the rise, fall, and re-emergence (of sorts) of Image Comics it is more than just a documentary about a comics company. It is a documentary about a business. That being the case, it is a presentation that will reach not just comic book lovers but even those with any interest and/or experience in the business world. That is the central element of program that makes it worth the watch. The manner in which the documentary was presented is another element worth noting. That includes the interviews with those that founded Image Comics and the comic book panel style transitions and the vintage footage incorporated into the documentary. Last but hardly least of note in this presentation is its bonus interview segments. The bonus material in question presents the interview material not included in the program’s main presentation. So basically they round out the documentary in whole. It’s one more part of the Image Revolution’s whole that makes it such an interesting watch whether one is a comic book fan, an artist, or a business person. Altogether, all three elements make The Image Revolution an early candidate for a spot on 2016’s list of Best New Documentaries. The Image Revolution is an early candidate for a spot on 2016’s list of the year’s Best New Documentaries. The documentary’s subject matter is the main element that makes it such a worthwhile watch. 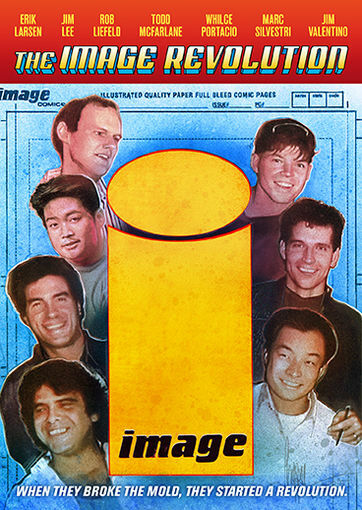 The documentary’s subject matter centers on the history of independent comic book publisher Image Comics. It follows the company’s meteoric rise to fame (and that of the men that started the company), its fall, and eventual return to greatness. The story is one that will appeal not just to lovers of comic books and graphic novels but to artists of all types and even those with any interest and/or experience in the business world. It is not just a niche presentation despite its subject matter. It shows how a group of men working for America’s two biggest comic book companies left those companies in order to form a company that was to be the antithesis of those companies yet in its own way became everything that it stood against. In turn it ended up struggling to a point before enjoying a revival that has continued to this very day. Those that are lovers of comic books and graphic novels will appreciate the story of how far Image Comics has come as well as the collective story of the men that started Image and the titles that each used to launch the company. Those that are experienced in art in its various forms will appreciate the discussions on how each man started out drawing his respective title but then found himself growing away and relegating that duty in large part to someone else. Those that have any experience and/or interest in the business world will find interesting the very story of the financial irresponsibility of the company’s founders. That irresponsibility would of course serve as a lesson for each as the men grew both by themselves and together. Whether one focuses on the business aspect of the story, that of the men and titles that launched Image Comics, or the different art styles of each artist, there is something for a number of audiences. This is just one way in which The Image Revolution proves itself to be such a worthwhile watch and standout documentary. It isn’t the only element that makes it stand out so well either. The manner in which the documentary was presented is another important element in the whole of its presentation. The story that lies at the center of The Image Revolution is in itself an important part of this documentary. It is a multi-faceted story that will reach more than just the obvious audience base. This is just one element that stands out in The Image Revolution’s overall presentation. The manner in which the documentary is presented is just as important to its presentation as the story at the center of the program. The program is presented through a mix of interviews with Todd McFarlane, Rob Liefeld, and the rest of Image Comics’ founders, classic footage from the company’s vaults, and transitions presented in the fashion of comic book page panels. The interviews allow McFarlane and company to tell the company’s story in their own words. While each man chooses his words wisely, none minces words at the same time. Audiences will laugh as Rob Liefeld does his best impersonations of McFarlane from time to time. On another note, Jim Lee’s discussion on being asked to take part in Rob Liefeld’s removal from Image is just as interesting. Audiences can hear it in Lee’s voice and see it in his face how much it pained him to have to be part of that change. Savage Dragon creator Erik Larson and The Walking Dead creator Robert Kirkman have their own interesting anecdotes over the course of the documentary. Audiences will laugh as Kirkman reveals how he got Image to take a chance on The Walking Dead. That won’t be revealed here. That is because of its link (so to speak) to The Walking Dead series. Audiences will actually laugh at Kirkland’s ultimate revelation. At the same time, said revelation will keep audiences watching the TV series just as rabidly as a result. Erik Larson’s humility in discussing how he handled the fame and fortune early on and even later on is refreshing. It shows that he didn’t and hasn’t let any of what he does go to his head. The interviews that are featured throughout the course of The Image Revolution’s eighty-three-minute run time are their own important part of the approach to the documentary’s presentation. The classic footage that is incorporated into the documentary adds even more interest to its overall presentation, too. It is clear that the footage was recorded via VHS camcorder. That is because it is obvious no attempt was made to clean up the footage. The footage in question features McFarlane and company at comic book signings that were jam packed with fans at every stop. There is also footage of how things went in the Image offices on an everyday basis along with much more. Audiences will love watching all of the vintage footage. It will transport viewers back to Image’s golden age and really serve to show how high things were for all involved at the time. At the same time, it helps to heighten the story as it advances. Speaking of that advancement, the transitions are just as important to the program’s presentation as its interviews and vintage footage. The transitions that are used throughout the course of The Image Revolution might not seem like all that important of an element to its presentation. But believe it or not they are in fact quite important to its presentation. The transitions are presented as panels from the pages of a comic book right down to their animation. They serve a special purpose in the story. That is because they really increase the story’s emotion in both directions, thus keeping audiences fully engaged. Together with the interviews and vintage footage all three elements combine to make the presentation of The Image Revolution rock solid. Of course they are still not all that makes this documentary worth the watch. The extended interviews that are included as bonus material round out the documentary. The approach that was taken in presenting The Image Revolution is in itself a powerful element in the whole of this new documentary from Shout! Factory. So much thought and work obviously went into its thorough presentation. That set alongside the documentary’s central story gives audiences plenty of reason to watch this program. As much reason as they give viewers to watch this documentary, they are not its only notable elements. The extended interviews that are included as bonus material round out the presentation’s positives. The interviews in question are, as labeled, extended. They feature more in-depth discussion than what is presented in the main body of the documentary. Liefeld, Lee, and Kirkland are all featured in the interviews. They discuss a variety of topics, too. From the success of AMC’s The Walking Dead to working on specific books and more, there is plenty for audiences to appreciate here. There is even a secondary set of interviews with those close to Image comics that adds even more interest for audiences. Those collected interviews combine with the work put into the documentary’s presentation and the documentary’s primary story to make a nearly ninety-minute presentation that comic book fans will love just as much as artists and even those in the business world. Marvel Studios’ Guardians of the Galaxy is the best new movie of 2014 hands down. This diamond in the rough is a solid answer to director Tim Burton’s recent declaration that he wanted to see a happy superhero movie. Given, the “guardians” aren’t exactly superheroes. But at a time when the fare offered by Marvel and DC has become increasingly dark and dominated by damaged, anti-hero figures, this movie shines as the antithesis of those movies. One part action and one part fantasy it is the breath of fresh air that the superhero/comic book genre has needed for some time and could not have come at a better time. The movie’s multifaceted script lies at the center of its success. The acting on the part of the movie’s cast is just as important to its success. And last but hardly least worth noting of the movie’s success is its collective look and feel. That includes both its backdrops and its special effects. The combination of all of these elements proves exactly why Marvel’s Guardians of the Galaxy is one of this year’s best new movies if not the year’s best new movie. One can only hope that Marvel won’t abandon everything that made this movie great when its sequel comes along in 2017. Time will tell. Until such time, audiences will agree that this movie more than deserves a spot on any critic’s list of the year’s best new movies. When Warner Brothers debuted its Tim Burton-helmed take on Batman in 1989, it proved to be something of an anomaly. No movie at the time or even before had taken the route taken by this movie. It was dark and brooding, just as Bob Kane had first envisioned him. It wouldn’t be until 2005’s Batman Begins that audiences would see the rebirth of the brooding superhero. Some will argue that 20th Century Fox’s X-Men franchise, which started in 2000, would qualify in that category. But that’s only because of the inclusion of one Wolverine. That being said, Batman Begins is to thank and to blame for what has become of the superhero/comic book genre. That being said, the debut of Guardians of the Galaxy is a breath of fresh air. It is the antithesis of those movies in every sense. And that is thanks first and foremost to the movie’s multi-faceted script. The script, crafted by James Gunn and Nicole Perlman, avoids every one of the trappings of the movies churned out by both Marvel and DC in recent years. One of those trappings is the brooding superhero approach used by both Marvel and DC throughout the studios’ ongoing competition. The script keeps the brooding to an extreme minimum with the extent of it being centered on Peter’s own thoughts of his mother’s death when he was a boy. The brooding on the part of Drax and Gamora on the loss of their own families at the hands of Thanos and Ronan is kept to just as much of a minimum. Because Gunn and Perlman keep the characters’ brooding in question, it allows for the movie’s related themes, jokes, and story to take center stage. The end result is a script that while hardly timeless is still one of the most entertaining to come along in a long time both within the superhero/comic book genre and within the action drama in whole. Gunn and Perlman are more than deserving of applause because of the fact that they took the road less traveled in their script, opting to keep the story’s brooding to an extreme minimum. In comparison to the rest of the movies churned out by Marvel and DC in recent years, it really is the single most important factor of the duo’s script. It isn’t the only reason that the script works, either. The themes of family and friendship that the pair incorporated into the story are even more reason for applause. They go hand in hand with that lack of brooding. Throughout the course of the story’s script, Gunn and Perlman note the importance of family and friendship. Gunn and Perlman essentially tell audiences through their script that friends and family don’t have to be just like one another to come together. They don’t always have to completely like one another, either. They even go so far as to jokingly say through the quartet’s interactions that the least likely of friends and families can come together when one least expects it. This message is driven home in the movie’s final minutes, which won’t be given away for the sake of those that have yet to see the movie. It is something of a cheesy moment, given. But again in comparison to the previous releases from Marvel and DC, it’s a refreshingly cheesy moment. It’s yet another aspect of the Guardians’ script that makes the movie such a success. The jokes that are tossed around throughout the movie is yet another aspect of the movie’s script that adds to its enjoyment. The contrast of the positive themes and overall lack of brooding in the Guardians’ script is a hugely important aspect of the script that makes it a success. The jokes that are tossed around throughout the script make it even more of a joy for audiences. Whether it be the jokes added to Peter Quill and Rocket Raccoon’s banter or the pop culture references used as jokes, or other jokes in general, Gunn and Perlman did an outstanding job in this area, too. The banter between Peter and Rocket is a laugh riot. Of course the acting on the part of Chris Pratt and Bradley Cooper respectively doesn’t hurt that banter and its jokes, either. It’s classic back and forth that audiences haven’t seen in a very long time. There are also plenty of pop culture references used themselves as jokes, including constant references to the hit 1984 Kevin Bacon starring vehicle Footloose. And Peter’s attempt at a dance-off in order to distract Ronan at one point (again that moment won’t be revealed here) is itself a reference to Michael Jackson if one watches closely. It’s one thing to use pop culture references in a movie or TV show by themselves to get laughs. But to use them as jokes (especially as running gags) is rather smart writing. There are also plenty of stand-alone jokes that will have audiences laughing along the way, too. The jokes in question aren’t right in audiences’ faces. But they are clear enough that there’s no missing them. Again, such placement is very smart writing. It still is not the end of what makes the script’s writing the key point of success behind Guardians of the Galaxy. Last but not least worth noting in considering the strength of the Guardians’ script is the story itself. The story behind Guardians of the Galaxy is the last element of its writing that makes it the hit that it has deservedly proven to be. The reason that the story works as well as it does is its simplicity. It seems on the surface that there is a lot involved in the story. That is because of the amount of backstabbing that goes on. But the story, at its heart, centers on one fanatical madman’s attempts to destroy an entire race of people and their home world because of his own personal beliefs. It was used in J.J. Abrams’ recent reboot of Star Trek most recently. It’s a tried and true plot that has been used any number of times before in other action movies. And even here it still manages to work in its given setting. This is especially worth noting considering the story’s extra elements—the chase for Peter Quill and the Orb, Gamora backstabbing Ronan, etc. There is a lot of extra backstory that is thrown into the mix. That extra could easily have bogged down the central story. But even with two people handling the script, that didn’t happen, amazingly enough. Because those extras don’t bog down the movie’s central plot, said plot is that much easier to grasp and follow, thus keeping viewers engaged from start to finish. That, alongside the other noted factors that went into the script, shows once and for all why the movie’s writing makes it the best new movie of 2014. A lot of work went into the writing behind Marvel’s Guardians of the Galaxy. The painstaking efforts that were taken to make this blockbuster stand out against its competition were not for naught, either. Rather it collectively paid off and then some. The acting on the part of the movie’s cast should not be ignored as a reason for its success, either. The acting on the part of the movie’s cast is just as much to thank for its enjoyment and success as the writing behind the movie. The constant back and forth banter between Bradley Cooper and Chris Pratt makes for plenty of laughs throughout the movie. At no one point does the duo’s arguing feel forced. It feels entirely natural, which is what makes it so entertaining. Cooper’s portrayal of Rocket set against Vin Diesel’s Groot is just as funny. Both situations are classic comedy brought into the 21st century. Pro wrestler Dave Bautista’s own interactions with his cast mates on screen make for their own laughs, too as audiences will see when they watch the movie for themselves. One would be remiss to ignore Pratt’s own comic timing both by himself and set against the talents of others. Audiences will laugh uproariously at his comic timing when he distracts Ronan with his “dance off.” It’s yet another way that the cast’s acting makes Guardians of the Galaxy such a surprisingly entertaining work. Yet it still is not all that makes this movie so enjoyable, either. The movie’s look and feels make the movie even better. They collectively round out the movie’s positives and prove once and for all why any lover of action movies and the superhero/comic book genre will love this movie. 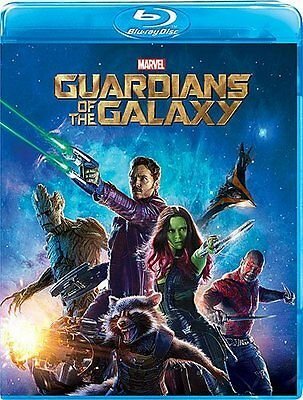 Together with the cast’s acting and the movie’s overall writing, it proves once and for all why Guardians of the Galaxy is the best new movie of 2014. It seems like almost every one of the movie spit out by Marvel and DC in recent years have become increasingly dark and gritty in their stories but in their look and feel, too. Thankfully Guardians of the Galaxy is the polar opposite of those movies in this aspect, too. It incorporates some dark elements in terms of its look and feel, yes. But there are also rather bright, colorful backdrops used throughout the movie. And thanks to all of the comic elements incorporated into both the movie’s script and the cast’s acting, the movie’s feel is just as colorful, light, and light-hearted. It is such a welcome change of pace from all of the movies released by Marvel and DC in recent years and even harkens back to the likes of Iron Man in its own interesting way. Not only does it have that same sort of light hearted, comedic feel, but it also has that same sort of playful edge about it, too. That mix of the movie’s fun feel and its balance of light and dark backdrops is perfectly balanced from the movie’s opening flashback to its final minutes. The end result of that mix leaves audiences wanting to see more in the best way possible. With any luck, Guardians 2 will have just as much of a positive look and feel. For that matter hopefully it will have just as solid a script and acting. If it does, then it will prove the success of this movie to be far more than just a fluke. So much work went into bringing Marvel’s Guardians of the Galaxy to life. And that work more than paid off. The movie’s multifaceted writing is its cornerstone. It incorporates themes of family and friendship that audiences of all ages will appreciate. It also avoids all of the brooding that has been a trademark of so many of Marvel and DC’s other previous releases. And the story itself is simple in every sense of the word. The acting on the part of the movie’s cast makes the movie all the more entertaining. It will leave audiences laughing nonstop from beginning to end. The look and feel of the movie is the polar opposite of so many movies that have come before, too from Marvel and DC. Each noted element makes Guardians of the Galaxy a memorable and entertaining movie in its own right. Together, they make it the single best new movie of 2014 fluke or not. Independent movie studio Anchor Bay has crafted some of the industry’s most surprising and underrated movies since the start of the twenty-first century. Most recently, Anchor Bay was behind the moving human drama that is Unfinished Song and the more lighthearted romantic comedy Shanghai Calling. It was also behind the release of the equally under appreciated 6 Souls and Dark Skies. Now in 2014, Anchor Bay has released yet another impressive yet under appreciated movie to its ever growing stable in the form of In Fear. While it is an indie flick, In Fear proves to be yet another piece from Anchor Bay that holds its own against any of the major horror flicks and thriller features out there today. The primary reason for that is the movie’s writing. This includes its plot. Another reason for its success is the acting on the part of Iain De Caestecker (Marvel’s Agents of S.H.I.E.L.D. ), Alice Englert (Beautiful Creatures) and Allen Leech (Downton Abbey). And last but not least, In Fear works because of its cinematography and associated editing. All three of these factors together prove In Fear a work that will leave any open minded horror and thriller fan in happiness. 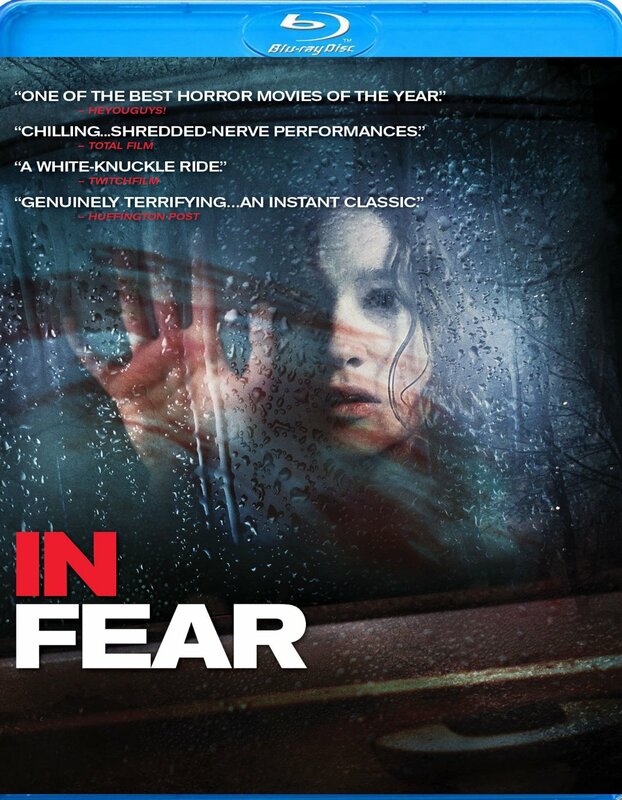 In Fear is not a major, big budget horror or thriller flick, obviously. What it is though, is a movie that any open-minded fan of both genres will enjoy. The main reason for this is the movie’s writing. The general plot starts out as one that has been done so many times before. Here, audiences see a young couple off on what is supposed to be a romantic weekend at a secluded hotel. But obviously, things eventually start to turn to the negative side of the needle for lack of better wording. This is where writer/director Jeremy Lovering takes the *ahem* high road (bad pun fully intended). It would have been so easy for Lovering to simply allow In Fear to descend to the dumbed down, overly violent level of so many major horror and thriller flicks from here. Instead, he kept the overt violence to a minimum by comparison. Where far too many major horror and thriller flicks fill their run times with unnecessary violence, blood and gore, Lovering has virtually eliminated those elements, using only what was absolutely necessary to help maintain the story’s grip on viewers. And the standard exploitative sexual content thrown in to those major motion pictures is totally nonexistent here. For that reason alone, Lovering deserves a lot of credit. The minimized use of blood, gore and general violence and the complete lack of exploitive sexual content is just one part of what makes this movie’s writing work so well. Lovering keeps viewers wondering even after Tom and Lucy let Max into their car. Audiences have to admit that had they been in Tom and Lucy’s position, they too would be uncertain as to whether or not Max was good or bad. So any viewer that might like to claim the movie was predictable is proven wrong through this avenue alone. That unpredictability is heightened through the use of certain elements that also lead to some “a-ha” moments by the story’s end, too. Those “a-ha” moments illustrate even more the depth of Lovering’s writing in his script and in turn its enjoyment. Jeremy Lovering’s script for In Fear is the cornerstone of the movie’s success. The acting on the part of Iain De Caestecker, Alice Englert, and Allen Leech serves to strengthen the movie even more. The trio is entirely believable in its acting. Caestecker and Englert expertly exhibit the growing tension and fear felt by any normal person lost in unknown territory. Given, the odds of being lost and hunted by an unseen predator of sorts are slim to nil in reality. But the fear caused simply by being lost in unknown territory is very real as is the general fear of the unknown. And Caestecker and Englert have made that fear all the more real through their acting. Any viewer will be able to relate to them as they watch the pair try to reach the Kilairney Hotel thanks to the seriousness with which the pair took its roles. Together with the script, this aspect of In Fear makes the movie all the more gripping and enjoyable for viewers. The acting and writing behind In Fear both are pivotal to the success of the movie. There is still one more aspect of the movie that adds to its enjoyment. That factor is the movie’s collective cinematography and editing. Some of the best shots of the entire movie come as Lucy is looking out of the car, waiting for she and Tom to reach the hotel. Audiences see trees hanging ominously overhead as the sky slowly darkens. These are such subtle shots. But they are so powerful because they are so powerful. It adds to the feeling of tension and being trapped in an enclosed environment for extended periods of time. The way that editor Jonathan Amos (A.C.E.) transitioned the two shots adds so much by doing so little. Those behind the cameras are just as worthy of applause for the solid yet short shots of the figure that seems to be hunting Tom and Lucy. Audiences get just enough of a glimpse to know that there is something outside that car that doesn’t want the pair around. And the shots are just plentiful enough to add to the movie’s fear factor, too. Again, it shows the expert work of Amos and his co-workers behind the cameras. There are far more examples of how the cinematography and editing make In Fear a horror/thriller worth seeing. Audiences will find even more examples when they purchase or rent the movie for themselves on DVD and Blu-ray. Whether for the cinematography, the editing, the acting or for the general writing, any open-minded fan of the thriller and horror genres will find plenty of reasons to check out this latest underrated and under appreciated release from Anchor Bay Entertainment. The movie is available now in stores and online. It can be ordered direct from Anchor Bay Entertainment’s website at http://www.anchorbayent.com/detail.aspx?projectID=2545b3bd-9d4b-e311-bba7-d4ae527c3b65. More information on this and other releases from Anchor Bay Entertainment is available online at http://www.anchorbayent.com, http://www.facebook.com/AnchorBay, and http://twitter.com/Anchor_Bay. To keep up with the latest sports and entertainment reviews and news, go online to http://www.facebook.com/philspicks and “Like” it. Fans can always keep up with the latest sports and entertainment reviews and news in the Phil’s Picks blog at https://philspicks.wordpress.com. Comic books are big business today. One look across the TV spectrum and through theaters in recent years shows just how massive a money maker it has become. The problem is that so many people today still think that comic books past and present are just that. Thankfully, PBS recently released a new documentary centered on comic books that proves that commonly held belief is completely wrong. It reveals just how closely comic books and everyday life have been ever since the first comic heroes hit the printed page way back in the 1930s. Superheroes: A Never-Ending Battle follows the history of not just superheroes, but the comic industry from its earliest days in newspapers to its current era. It splits the history of the business into three separate segments beginning with its earliest days in 1938 to the present. Each of the three segments clearly explains how the comics industry and American society affected one another. Interviews with those that created some of the greatest superheroes to those charged with bringing those characters to life help to illustrate these stories, as does the inclusion of vintage video and audio showing the impact of the pair on each other. The interview segments included with the main feature are collectively a real bonus to the presentation. That is because audiences get to hear from great names such as Stan Lee, Linda Carter, and even Adam West as they expand on the topics raised in the main feature. Their thoughts are quite enlightening and make the documentary’s overall presentation all the more worth watching whether one is a comic book fan or not. Superheroes: A Never-Ending Battle is quite the documentary. Whether or not one is a comic book fan, audiences will appreciate it as it shows one more way in which art and real life can and do affect one another. It dispels the beliefs about the comics industry that have been held for far too long by those that are less knowledgeable about the industry. The entire documentary comes in at a total run time of roughly three hours. Those three hours are split in three separate roughly hour-long presentations. The first takes audiences from 1938 – 1958. The second takes viewers through some of America’s most turbulent years from 1959 – 1977. And the last of the three segments runs from 1978 up to the present. Over the course of each segment, viewers get an in-depth look at just how closely world culture and the comics industry are connected. One of the most interesting facts that audiences will learn is the uphill battle the comics industry has faced against the government from early on. Even as late as the late 1970s, the comics industry remained under fire from government bodies. Just as interesting is the seeming up and down trend that the comics industry has experienced from its earliest days. There is much more that audiences will be able to take away from each of the documentary’s three segments. Each viewer will find something for himself or herself when they order the DVD direct from PBS’ online store. The information shared through each of the documentary’s three segments is in-depth and at times eye opening. But it would be nothing with the vintage video and photos to help illustrate the many subjects discussed within the course of each segment. Audiences actually get to see and hear former President Jimmy Carter voicing his negative opinion of the comic book industry. There is also footage of the classic Batman TV series starring none other than Adam West and Burt Ward as part of a discussion on its connection to the era in which it aired. There’s even a discussion on the most beloved of the Superman movies complete with footage from said movie, and footage of soldiers reading comic books during World War II. It shows collectively just how important the comic industry has been to America throughout the ages even in its lower points. It’s one more aspect of this documentary that viewers will appreciate regardless of whether or not they are comic book aficionados. 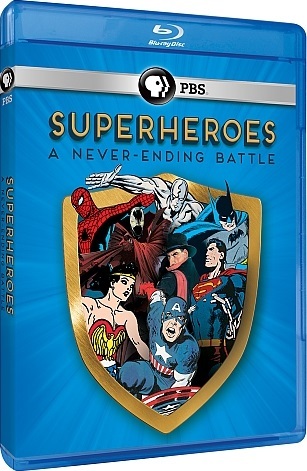 From the information shared throughout the whole of Superheroes: A Never-Ending Battle to the accompanying video and audio footage, this documentary is another success from PBS. But no documentary would be complete without at least some bonus content. And this DVD more than offers that. It offers as bonus content, interviews with the likes of Adam West, Stan Lee, Linda Carter and others within the comics industry. Stan Lee shares his thoughts on how his characters came to be. One of the funniest moments is his anecdote about how students in a college level course were discussing the Silver Surfer at a deep philosophical level. Carter discusses the role of Wonder Woman in feminism. And West discusses the role that his Batman played in the country’s nuclear age and how that led to its campiness. As with the in-depth information shared throughout each of the documentary’s three segments, there is even more to discover from the bonus interviews. There is even a remembrance of sorts for animation legend Jack Kirby. That and so much more is contained on one disc that audiences can order now online from PBS’ online store at http://www.shoppbs.org/product/index.jsp?productId=23148226&cp=&sr=1&kw=superheroes&origkw=Superheroes&parentPage=search. More information on this and other releases from PBS is available online at http://www.facebook.com/pbs and http://www.pbs.org. To keep up with the latest sports and entertainment reviews and news, go online to http://www.facebook.com/philspicks and “Like” it. Fans can always keep up with the latest sports and entertainment reviews and news in the Phil’s Picks blog at https://philspicks.wordpress.com. Shout! Factory has made quite the name for itself in recent years by releasing some of the twentieth century’s greatest TV shows and movies. Partnerships with variety of companies have resulted in the release of classic 90s Nicktoons and some equally beloved older movies including: The Producers, Swamp Thing, and They Live just to name a few. While many of Shout! Factory’s releases in recent years have been relatively well known to American audiences, there have been those releases that are far more obscure. Earlier this year, Shout! Factory partnered up with an Australian company to release the Dr. Who spinoff, K­–9: The Complete Series. Now as the year winds down, Shout! Factory has partnered with British network itv to release another more obscure classic series in the form of Sapphire and Steel. Sapphire and Steel was a show well ahead of its time. An examination of its writing and production values proves this. A side-by-side comparison with the likes of Fox’s hit sci-fi series The X–Files and Fringe shows just how far ahead of time Sapphire and Steel was in its original run from the late 70s into the 80s. That comparison will prove in the grand scheme of things just how important Sapphire and Steel is today, despite its original short, roughly four-year run. Sapphire and Steel was in its original run, one of very serials on the air at its time. Other than soap operas, most networks during the 70s ran very few primetime serials. This applies even with British television. That aspect alone puts Sapphire and Steel far ahead of its time. Putting it even far more ahead of its time is that despite audiences’ desire to compare the two, this series is nothing like its fellow British sci-fi series, Dr. Who. The only concrete similarity that the two share is the fact that Sapphire and Steel are able to travel through time with ease as they investigate various cases. Other than that, there are no similarities between the pair. If anything Sapphire and Steel can be more easily compared to Fox’s The X–Files and Fringe. All three shows see their main characters investigating experiences that defy any logical explanation. In the case of Sapphire and Steel, audiences see its two main characters investigating most notable the case of a man who had the ability to trap people in photographs in one episode. Another saw them investigating a haunted train station that was already being investigated by a self-proclaimed ghost hunter. And in one of the most interesting of the short-lived series’ episodes, Sapphire and Steel have to deal with a pair of time travelers from the future. The dialogue between the characters is simple enough for any viewer to follow. And the music written in as a bed for each scene helps make each one even more gripping. One must not forget the manner in which each episode ends, too. The show’s writing staff made no bones about the fact that this show was a serial. The semi-cliffhanger episode endings were expertly written. They kept viewers really wanting to know what will happen next. This is a tribute to the work put into each episode by the show’s writers even with each episode being split into so many episodes. That writing made having so many episodes per story enjoyable, rather than annoying as some critics would like to believe. The writing behind Sapphire and Steel is the series’ key point of success. The show’s writers crafted stories that were largely unlike anything that other British, and even American dramas of the time were doing. Also to be factored into the show’s importance is its production values. The general production values of Sapphire and Steel are by today’s standards rather low grade. However, when one looks at the production values in a larger picture, those behind the show used what they had at the time. The result is that it led the show to rely on its writing and acting for its success. That’s not to say that in hindsight the special effects are low budget. There is something about the show’s production values that in comparison to so many of today’s TV shows and movies that makes one appreciate them. Today’s movies and TV shows are so over the top in terms of their production values that it makes them feel boring. Classics such as this show though, have more substance. It uses the production values as a companion tool to the writing, thus giving audiences a truly full viewing experience. Whether one is familiar with Sapphire and Steel or not, it proves with its combination of solid writing and its production values that it’s a show that any sci-fi fan should see at least once. Perhaps in doing so, said viewers will gain a new appreciation for not just the one show, but classic science fiction television and film making as a whole. 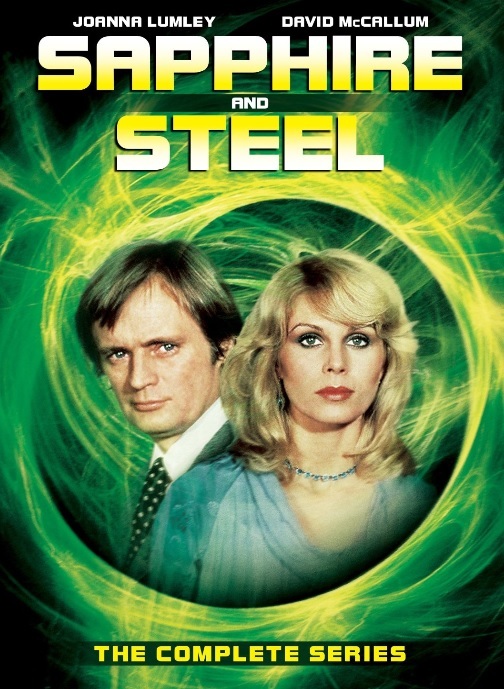 Sapphire and Steel is available now on DVD in stores and online. It can be ordered direct from the Shout! Factory online store at http://www.shoutfactory.com/catalog/search/?uc_search_word=Sapphire%20and%20Steel. More information on this and other titles from Shout! Factory is available online at http://www.shoutfactory.com and http://www.facebook.com/shoutfactoryofficial. Marvel Animation releases the latest in its “animated” series, Iron Man: Armored Adventures next Tuesday, April 23rd. 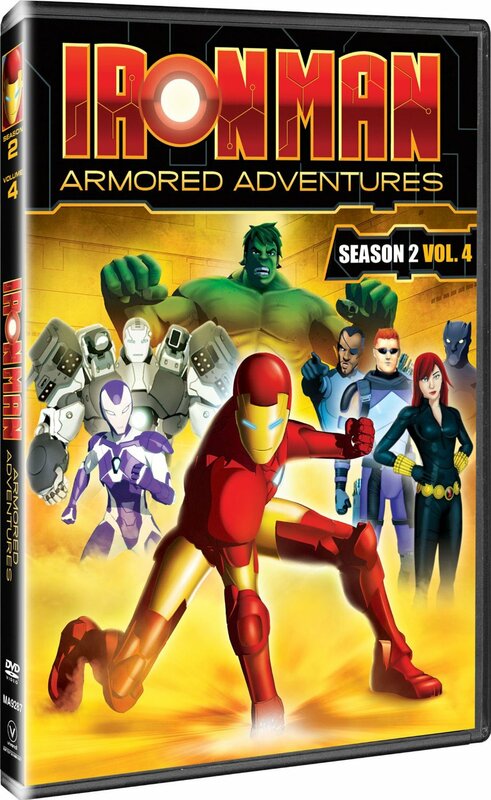 Iron Man: Armored Adventures Season 2 Volume 4 follows the continuing journey of the teenage Tony Stark and his friends as they face the forces of evil. This time out, Tony finally discovers that his father is actually alive only to have to save his life again. Also in this finale to the show’s second season, Iron Man and his friends also have to face off against the evil Dr. Doom, and Pepper Potts even gets her own suit of armor. And what action series would be complete without an alien invasion? The season closes out with an epic battle against the Makluans. All of this and more spans eight episodes in one more disc that finishes off the second season of Iron Man: Armored Adventures. The show’s cg-based “animation” continues to stand out from the rest of the crop of CG-based kids’ shows, continuing to help maintain its identity. This is especially the case considering that the recent Hot Wheels animated series and Stormhawks have gone by the wayside. Both of those shows used very similar cg based animation. Together with the packaging and the action packed episodes, audiences get another set of episodes that makes for a nice lead-in to the upcoming theatrical debut of Iron Man 3. Iron Man Armored: Adventures Season 2 Vol. 4 succeeds as a continuation of the season’s previous volumes and as a lead in to the upcoming theatrical release of Iron Man 3 thanks to its writing. This final portion of Season Two leads up to an epic faceoff with the Makluans. The faceoff in question is a result of actions by the teenage Mandarin in his search for the tenth ring. Viewers get an origin story not of just The Mandarin, but also of the rings. According to the legend presented here, the rings are actual alien in descent, and were used by an evil alien warlord to enslave other alien beings. In the process of everything, Pepper plays a role and is introduced as “Rescue” having gotten her own armor in the buildup to the battle with the Makluan. Keeping this in mind, the writing of the episodes included in this set, and the timing of its release will really help to build hype for the latest upcoming big screen feature. All involved with the series and its release are definitely to be commended for all of this. The writing and the timing of this set’s release make it a success. This goes without saying. Its form of CG-based “animation” adds to its success. There have been few modern “animated shows” that have used and use the form of CG-based art that this show uses. Two that come to mind immediately are: Stormhawks and Hot Wheels battle Force 5. Both shows have gone by the wayside. By comparison, the current success level of Marvel’s properties would seem to suggest that this program still has some life left in itself. And if that truly is the case, then fans can expect even more adventures from Tony, Pepper and Roady set against this largely unique CG-based animation style art. Until then, fans can check out all the adventures from this final quarter of the show’s second season when it hits stores next Tuesday alongside, Iron Man: Armored Adventures: The Complete Season 2. And for all things Iron Man and Marvel, fans can get all the latest when they “Like” Marvel on Facebook at http://www.facebook.com/Marvel or check in at the official Marvel website at http://www.marvel.com. Superman is flying again. And this time it’s thanks not to DC, but to a little company called Gaiam. 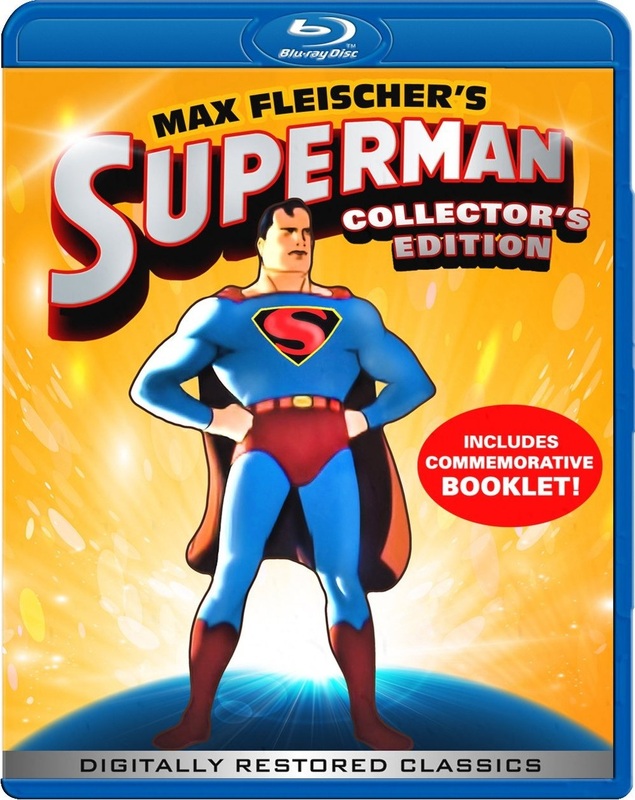 Thanks to Gaiam, Max Fleischer’s classic Superman cartoons have been restored and made available once again to the public. These classic cartoons are an example of everything that was once right with animation. And now not only can the generation that grew up with these classics enjoy them once more, but so can a whole new generation. At a time when DC and Marvel are increasingly going toe to toe with one another, churning out feature after feature (both on the big and small screen), this double disc collection is a welcome breath of fresh air for comic book fans the world over. While there may have been only a grand total of seventeen episodes of Superman created by Max Fleischer between 1941 and 1942, those seventeen episodes are some of the finest animation to ever grace any television screen. As with so many early pieces of animation, Fleischer and his team of nearly six hundred (yes, nearly six hundred) animators gave Superman its own identity through their work. This is something that has so sadly been lost in today’s “animated” features. Being that so many “cartoons” are created via computer, they all look alike. They’re sterile. They have no real identity, compared to the likes of Superman. Sure, older cartoons such as these took massive amounts of time, money, and staff. But the end result is well worth it. That is evidenced here. One might ask how it’s known that Fleischer used nearly six hundred animators and large amounts of money to create Superman. The answer to that is simple. The commemorative booklet included in this double disc set gives a full in-depth history lesson on how Fleischer came to ring one of the greatest superheroes of all time to the small screen. Dr. Thomas R. Reich, Ph.D. explains in the culled information that the shorts collected in this set were the result of discussions between Paramount and Fleischer Studios over a Superman movie. Because of the costs that the movie would have incurred, the two sides agreed that instead of a Superman movie, Fleischer would break up its movie proposal into what is now one of the earliest of the Superman TV series. Dr. Reich explains with excruciating detail how the series eventually came to life, and just as soon came to its end. There are also discussions on Fleischer Studios’ early days creating the likes of Gulliver’s Travels, Betty Boop, and even Popeye. The bonus booklet even includes a full episode listing with equally in-depth synopsis for each episode. The bonus booklet included in this new Superman Set offers loads and loads of trivia for audiences. The story of how these seventeen shorts came to be is enlightening to say the least. Just as enlightening is the revelation that it’s Fleischer and company who are to be credited with the now famous lines, “Faster than a speeding bullet” and “able to leap tall buildings in a single bound.” This is just one more example of the value of this set to audiences. Valuable information such as this, along with the equally impressive animation and storylines make this Blu-ray re-issue of Max Fleischer’s one of the best kids’ releases of the year. It also makes it one of the year’s best in the category of general DVD’s and Blu-rays. It will be available in stores and online on Tuesday, October 30th.